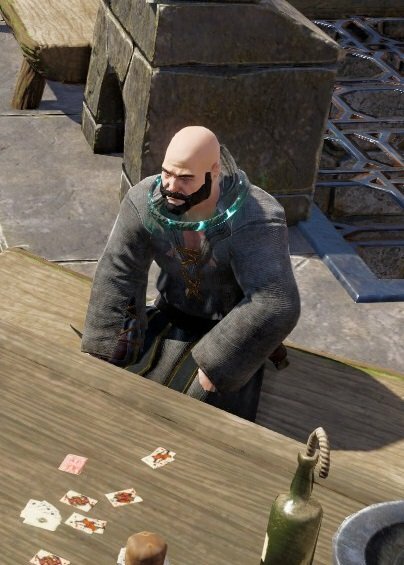 Ralvo is a NPC in Divinity: Original Sin 2. When approached, Ralvo will ask you to join him and his peers in a card game. When playing; you can choose to play your hand or to fold. Both of these options result in a loss and Ralvo will then ask you for a fee. If you accept; many items are taken off your person. If you deny; this will begin combat with Ralvo, Bottle Top, and Slug. You can win against Ralvo by playing The Sparkler Card, this can be obtained from Dain. If you lose the card game the first time with a character only wearing stolen goods (I think the maximum is three) and no gold, Ralvo will take those goods. When you trigger the fight later (either via dialogue, by hitting them, or repeatedly trying to steal the items on the table) you can reclaim your goods off of Ralvo&apos;s body, but now they no longer have the "stolen" tag. It&apos;s like money laundering; I "cleaned" Nebora&apos;s boots and Pigskin gloves this way. When you play cards with him and use the Sparkler, say you got the Sparkler off a dead guy that stole it from Griff. It ques a fight, you&apos;ll get more gold, plus some xp, and the items on the table, one of which is a very useful Identifying glass. If you mess up and forget to play the sparkler card, just say you don&apos;t have any money and talk to him again for another round of cards. I found a card called &apos;The Sparkler&apos; on the drunken man Doctor Leste is attending to after he died. You can play that card and win some gold (not sure how much as it didn&apos;t say). You may have to play the first round with him and either pay up or talk your way out of it before the drunken man dies and is lootable.